Are you ready to start and fund your small business? Use the Startup Assessment to discover the tools you need to start, plan and find funding for your business idea. 1. How much time do you currently spend on your business? But I'd like to start now. I have a job, but I spend a few hours a week on my business. My startup is my main focus. an idea for a business, but that's basically it. done some research, but need help with the next steps. started my business plan but could use some professional advice. Turning my idea into a viable concept for a product or service. Guidance in planning my business strategy. I need help figuring out how to finance my business. I could use some help with all of this. registered my business or obtained a business number. started working on my business plan. not completed any of these steps just yet. The Startup Portal is a simple and complete platform for starting your very own small business. Developed by entrepreneurs and consultants, it contains the tools and resources needed to evolve your idea from a dream to a full-fledged business. Whether you are brainstorming ideas, ready to register your business, beginning to write a business plan or looking for funding; access step-by-step guidance to help you to achieve the next step towards launching your small business. Try the Startup Assessment Tool and find out exactly what your Startup needs! There are no wrong answers. Take a moment to figure out where you stand on the road to launching your business, then discover exactly what goals you need to achieve to get you there. You may have an idea about how to start your business, but we have the tools to set you up for success. Identify your business' needs and access personalized resources. Get an idea, register your business and launch! Simple right? Not so much. Make sure you've got it all covered with step-by-step guidance spanning ALL stages from start to launch. 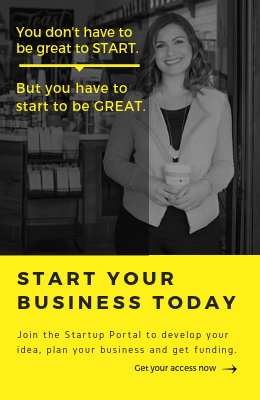 Get your small business started today! Discover how The Startup Portal can transform your business dreams into reality. Hear what our clients are saying about using the Startup Portal to help them achieve their small business goals. Find out how other entrepreneurs in your province have started their own small businesses. Do you have what it takes to be a small business owner in your industry? Need funding for your small business?